This represents a sampling of the graphic design and web site design I've done since about 1996, though admittedly nothing terribly recent. Projects are listed from most recent to oldest. The web sites are a mix of static sites and basic LAMP designs. 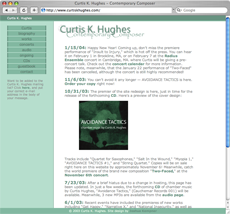 This site is the primary business site for Boston based composer Curtis K. Hughes. He wanted something professional looking but simple that would showcase his work. The initial redesign of the site in October 2003 was a simple overhaul of the look of the site using its existing structure. A more complete redesign has also been discussed, including the addition of several dynamic features, such as greater exposure of the concert listings throughout the site and an integration of all information about completed compositions, works in progress, audio samples, and studio recordings into a single database. 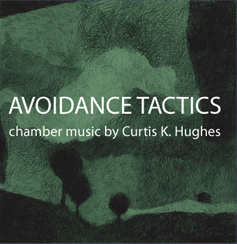 The CD is a collection of works by Boston area composer Curtis K. Hughes. The artwork for the cover, insert, traycard, and CD itself were drawn from digital renderings of a charcoal drawing inspired by one of the composer's pieces. I composited pieces of the drawing to create an original image for the cover that mixes representational and abstract elements, creating a scene that's almost a landscape but which intentionally avoids being entirely recognizable as such. I also did the layout for the jewel box insert and the rest of the packaging, including the CD itself. The CD can be ordered directly for $10 plus shipping from CCNow. “The Riddle of Cooling Flows in Galaxies and Clusters of Galaxies” conference was held in Charlottesville, VA in June 2003. I designed and implemented an online registration form for the conference. Because of the lack of a secure server, the registration back end had to generate PDF files that could be faxed or mailed with payment information. I also set up facilities for the conference organizers to generate these forms from the registration database. A full set of database management web pages were put into place to allow the conference organizers to perform tasks such as editing registration information, adjusting fees, and setting up the complete conference schedule. For the conference itself, I set up facilities for uploading electronic presentations through the web site. After the conference, these were then hooked into the database so as to be made public for download. A similar facility was set up for the proceedings articles, which are also available for download. 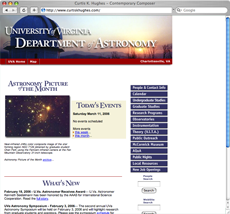 This site is primarily a resource for students enrolled in astronomy courses at UVa and for prospective students, but also has elements used frequently by people within the department. The department's events calendar must be generated dynamically to keep people apprised of colloquia, observatory public nights and other events. The department also maintains two observatories in and near Charlottesville, so I developed a web-based scheduling system for use of the two observatories. This system uses individual and group logins to prevent conflicts in the scheduling. It also keeps track of instruments that are usable on multiple telescopes so a given instrument cannot be scheduled to be in two places at once. The same underlying architecture is used for the events calendar. Since I designed them in about 2000, both calendar systems have stayed in use with minimal modification for almost a decade. There is also a significant public outreach component to the web site, including the Astronomy Picture of the Month on the main page and a searchable database of general astronomy information compiled in an ongoing effort by the graduate students (AQuA). The Graduate Research Exhibition needed its site to be updated into a form that would be easily modifiable from year to year. This included an automated registration process with hooks into the registration database, and a set of web pages (password protected) for the Exhibition registrar to manage the database. 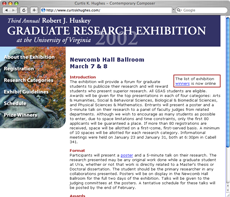 I also previously designed the web sites for the 2000 and 2001 Graduate Research Exhibitions. The site was designed to be reusable for at least several years, but has since been partly re-designed by the current maintainer of the site. As of the spring of 2008, the exhibition was still being held annually. 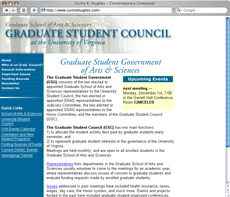 This site was intended as a resource for information about Grad Student Council and about issues of concern to graduate students. While not a particularly dynamic site, it was updated frequently to include information about recent council meetings and upcoming events for grad students. The site was re-designed in the spring of 2006, but for a few years continued to use modified versions of some of the graphics and design elements of my original design from 2000, pictured here. The more recent redesign of the site went in an entirely new direction. The target audience of the book is a semi-popular one, so the requirements for the cover were that it be somewhat flashy without being so gaudy as to turn off the serious scientists for whom the book would be a valuable desk reference. 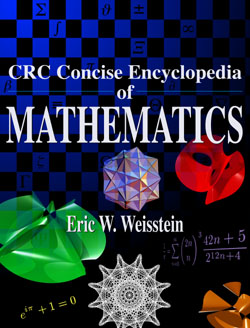 The first printing of the book became available in December 1998. This cover was used for the first edition of the book only (the second edition has a new cover). The original cover design (show at left) was full color, but CRC Press was cautious that sales would be too low to justify a full color printing, so an alternate single-color design was used in the final printing. The full color version was used for the first edition CD-ROM. Mouse over the image to see the single-color version. The book sold out its initial print run in pre-orders alone, and proved so popular that the second edition has a full color cover.